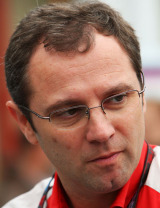 Stefano Domenicali is as much a product of Ferrari as the latest 458 Italia to roll out the factory gates. As team principal between 2007 and 2014 he was known as the media-friendly face of the team but, after securing just one constructors' championship in seven seasons, he failed to live up to the success of his predecessor Jean Todt. The son of a prominent banker in Imola, he was destined for a career in motorsport - and there was only one team in the running. As a child he used to go to the race track at weekends to help out in the paddock and the media centre. He studied business at Bologna University and sent his CV to Ferrari as soon as he graduated; he joined the team looking after the fiscal administration side of the business. At the same time he also achieved his clerk of the course licence in order to act as race director at Ferrari's Mugello test track. In 1995 he took charge of HR and sponsors and was promoted to team manager in 1998. He continued his rise through the ranks and became sporting director in 2003. Following the departure of Jean Todt in 2008, Domenicalli took on his job of team principal. In his debut year he helped the team bag its 16th constructors' championship, but missed out on the drivers' crown for Felipe Massa by just one point to Lewis Hamilton. The 2009 season was far less successful with the car lacking downforce and the team struggling to accommodate KERS. Ferrari's chances of a success were further dented when Massa was seriously injured in qualifying for the Hungarian Grand Prix, leaving Domenicali with the unenviable job of finding a replacement. Test driver Luca Badoer, who had not driven in a grand prix in ten years, took the seat, but after two races he was replaced by Force India's Giancarlo Fisichella. With all the problems the team faced it was only able to finish the season in fourth position, taking just one victory at Spa Francorchamps. In 2010 the team returned to winning ways with Fernando Alonso replacing Kimi Raikkonen. Alonso took four victories in total and was in contention for the title until a botched strategy at the Abu Dhabi Grand Prix scuppered his chances. Domenicali took plenty of flak from the Italian press, but it was nothing compared to the grilling he got from the world's media after ordering Felipe Massa to allow Fernando Alonso past at the German Grand Prix earlier in the season. In 2011 the cars from Maranello were no match for Red Bull and a single victory for Alonso at Silverstone again raised eyebrows, but with president Luca di Montezemolo firmly behind him in 2012, Ferrari had a much stronger season. However, there would be shades of 2010 again as Alonso fell agonisingly short of the title at the finale in Brazil. In 2013 Alonso recorded two wins early in the season before Ferrari's form tailed off. The regulation changes for 2014 promised a shaking up of the order but Ferrari soon found itself behind the Mercedes-powered teams and, after a frustrating result at the Bahrain Grand Prix, Domenicali resigned from his position on April 14, 2014.